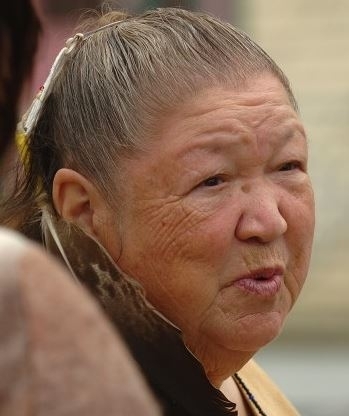 The Passamaquoddy, Malecite are a Native American people who reside along both sides of the border between Maine in the United States and New Brunswick, Canada. The name "Passamaquoddy" literally means "pollock-spearer" or "those of the place where pollock are plentiful", reflecting the importance of this fish in their culture. Malecite is an endangered language that is mainly spoken in the Saint John River Valley in New Brunswick; and Passamaquoddy is spoken mostly in the St. Croix River Valley of eastern Maine. There are very few speakers for both dialects, and those who can are elderly. However, language revival efforts are underway to restore its use among Maliseet and Passamaquoddy children. For more information on the language, see the Passamaquoddy-Maliseet Language Portal website. They value hunting, fishing, basket weaving and other crafts, storytelling and music. Preserving the beauty and wisdom of such a lifestyle has become their life's work. The Passamaquoddy were converted to Christianity by the French Jesuit priest with Samuel de Champlain in 1604. Today, the majority of Passamaquoddy are Roman Catholic. Pray God will open doors for Christians to share the gospel with unreached Passamaquoddy, Malecite people. Pray God will prepare the hearts and minds of Passamaquoddy, Malecite people to understand and receive the message of Christ. Pray evangelical Passamaquoddy, Malecite people will obey the Great Commission crossing cultures to share the message of Christ with the least reached people in North America and beyond.